See the card page above? 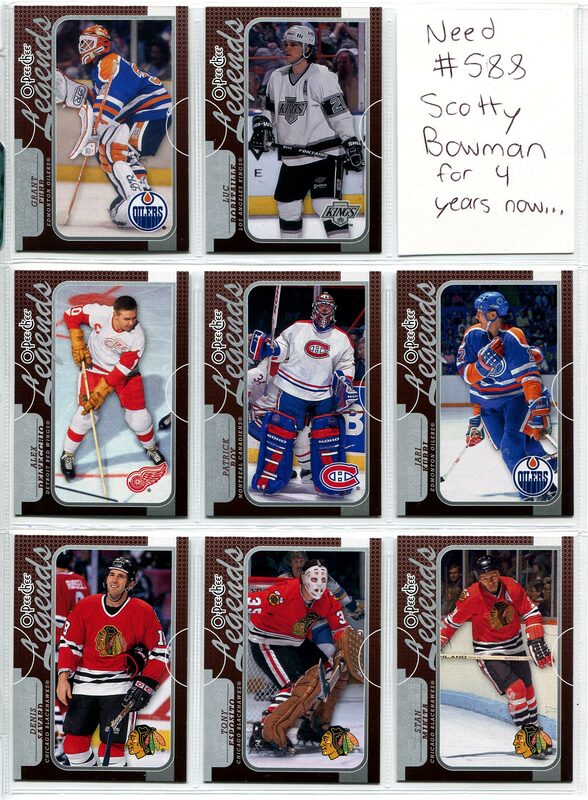 I needed just one card to complete my 2008-09 O-Pee-Chee Hockey set. I was tired of looking at that snarky little reminder I put where Bomwan’s card should be, so I finally decided to just buy it already. And then I couldn’t stop myself. Before I knew it, I ordered 84 other cards from the online shop Check Out My Cards. I’ve purchased from COMC in the past (review here). There’s something gratifying to be able to find so many cards that I need in one place. I figured I just needed to stop being cheap and spend 50-cents to $1 on some cards that I needed for a long time. The result? Thirteen sets killed off, thanks to COMC. 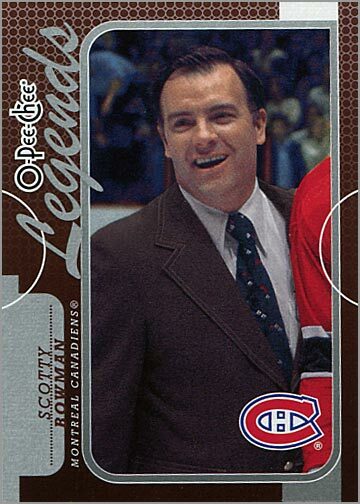 2008-09 O-Pee-Chee Marquee Legends Scotty Bowman – I started building this set in 2008, so I’m glad to FINALLY finish it SIX YEARS later. 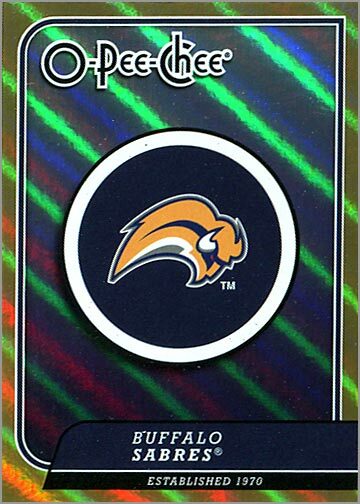 2008-09 O-Pee-Chee Checklists Buffalo Sabres – Gotta catch ’em all! 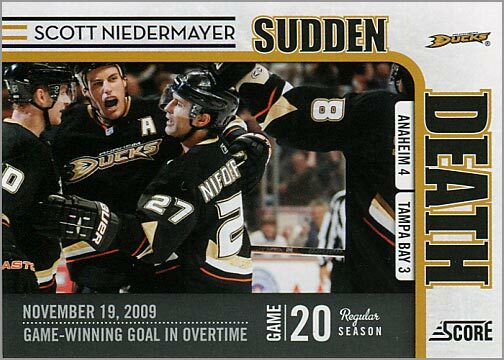 2010-11 Score Sudden Death Scott Niedermayer – I think I only built this insert set because I got so many of them from buying packs. 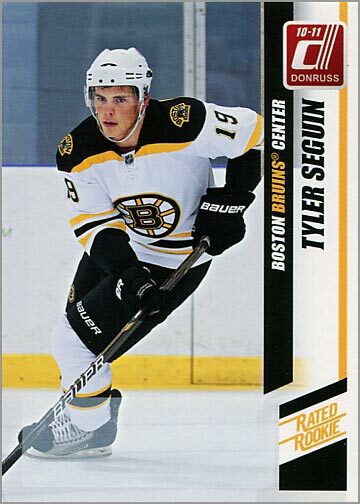 2010-11 Donruss Rated Rookies – I picked up Tyler Seguin, Jordan Eberle and a few other Rated Rookies to finally put this set to rest. 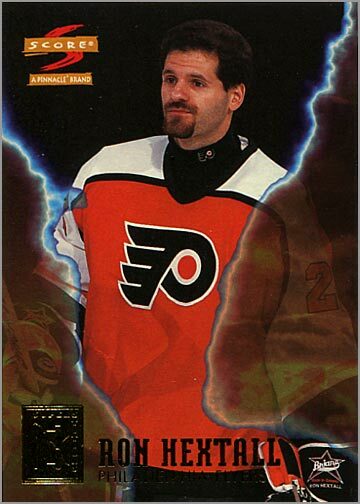 1996-97 Score Superstitions – I bought the entire insert set, so I don’t know if this technically counts as finishing a set, since I started and finished it in the same purchase. Look for an article about this set in an upcoming issue of The Hockey News. 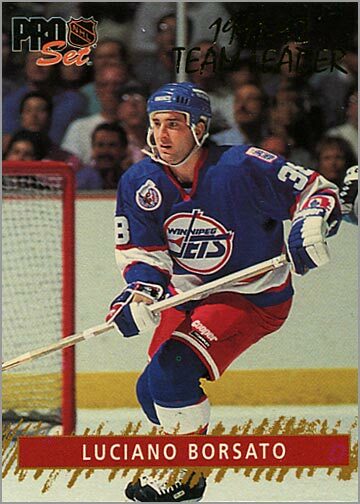 1994-95 SP Premier – I needed Wayne Gretzky and Mark Messier, who are coincidentally first and second n all-time scoring. 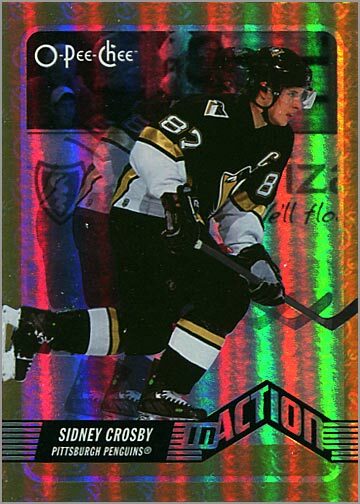 2007-08 O-Pee-Chee In Action Sidney Crosby – SHINY CARD MAKE RAINBOW!!! 2006-07 Power Play Prospects Dustin Byfuglien (and two others) – I foolishly bought a box of these cards back in 2008, then have been trying to complete the set ever since. Well, I needn’t try any longer. I picked up Big Buff and the two others I needed to cross this one out. 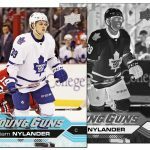 2013-14 Upper Deck Shining Stars Centers Nazem Kadri – Of course, I still need practically every Shining Stars Left Wings, Right Wings, Defensemen and Goalies. But hey — I got all the centers. 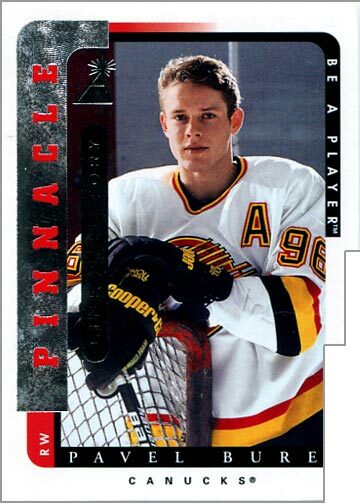 1996-97 Pinnacle Link 2 History – These cards are die-cut along the side, and interlock with one another. Every time I find one of these in a quarter box at a show, it is always dinged up or bent, due to the irregular shape of these cards. 1994 Signature Rookies Tetrad Vitali Yachmenev autograph – Oh sure, you may laugh. But I’ll have you know that Vitali Yachemenev played 487 games in the NHL with the Kings and Predators. This here is 88-cents well spent, my friends. 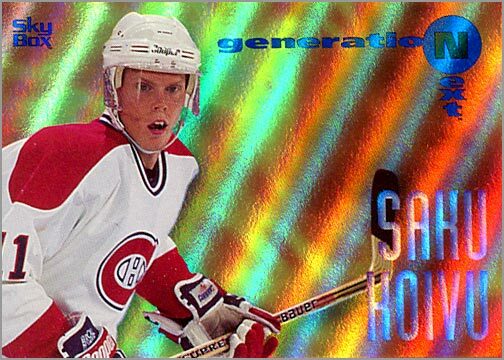 1995-96 SkyBox Emotion Generation Next – Finally got the last three that I needed: Ed Jovanovski, Todd Bertuzzi and Saku Koivu. 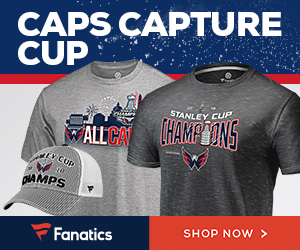 Coincidentally, all three are out of the NHL this year. 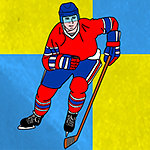 Koivu retired, while Big Bert and JovoCop are free agents who very well may have played their final games last season. 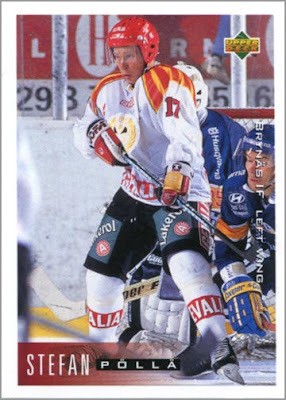 1992-93 Pro Set Team Leaders Luciano Borsato – One of the few Pro Set cards that I actually needed some 20 years later. A friend and I were discussing the cost of cards at COMC. He thinks their prices are a bit high, while I think the cost is justifiable. Most of the cards I bought cost between 44 and 88 cents each. That might be a lot for a “quarter card.” I also picked up many other cards, such as some 2007-08 Black Diamond double diamond and triple diamond short-prints (not shown here), for well under “book value.” So I think it all kind of evens out. I might overpay for a common card, but feel that I get great prices on the mid-to-high tier cards. Plus, I am SO tired of rummaging through boxes at card shops and card shows, hoping to find something I need. I’ll still hit the rummage boxes in hopes of finding something offbeat or cool. But I think I’ll leave the set building to trades and COMC orders. Has anyone else ordered from Check Out My Cards? 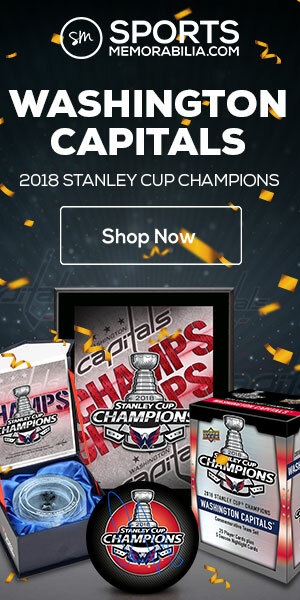 Has it changed the way you buy cards? What has your experience been? What are your thoughts on their prices? 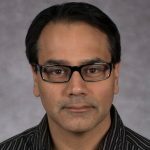 Great write-up Sal! I use the site much more frequently since they changed up their shipping pricing a year or two ago. It’s certainly an addicting site, and like you I’m sometimes willing to overpay by a few pennies for the convenience of getting everything I need in one place. Nice job knocking off all those sets! I use COMC quite a bit. Yes, some prices are a bit higher but I also come across many that are not. I was able to finish off several old Topps baseball insert sets and subsets very easily there. I try to wait until I have enough in my cart to order to justify the $3 shipping. Sal – I order from COMC when they have their annual Black Friday weekend event. They encourage the sellers to discount their cards during that weekend to help drive sales. Plus it’s free shipping to Canada if you order over a certain dollar amount. Like you have done, I’ve been able to complete some of my insert sets using COMC. Last year I also ordered some vintage cards. One of the benefits of the site is that they post photographs of the actual cards. When we are talking about vintage it’s beneficial to be able to see the condition of the card. My opinion of Ex-Mt may be different that someone else so having that visual to me is important. Another benefit is the great variety of what is offered on the site in regards to different types of sports and sets and years. That’s helped me finish those sets because I can’t find them at the local collectibles shows. The one drawback is that the common and base set cards are either not offered or have a higher price then I’m hoping to pay. I understand with the COMC system is not cost effective to offer common cards from modern sets. I’m searching for an on-line vendor within Canada who sells base cards at a reasonable price. Thanks for sharing your COMC experiences. Anyone else? I use COMC all the time… to see what the cards look like before I buy them on sportlots. I buy almost exclusively base common cards and can usually find a single seller with decent s/h to make a purchase worthwhile and much cheaper. BTW, what the neck did Luciano Borsato led the Jets in? I think it was point scoring among rookies, or something like that.